The impacts of population growth are many and only serve to exacerbate many of the social, environmental and economic challenges the world is facing. In our production and consumption driven economy, more consumers mean that more must be produced. 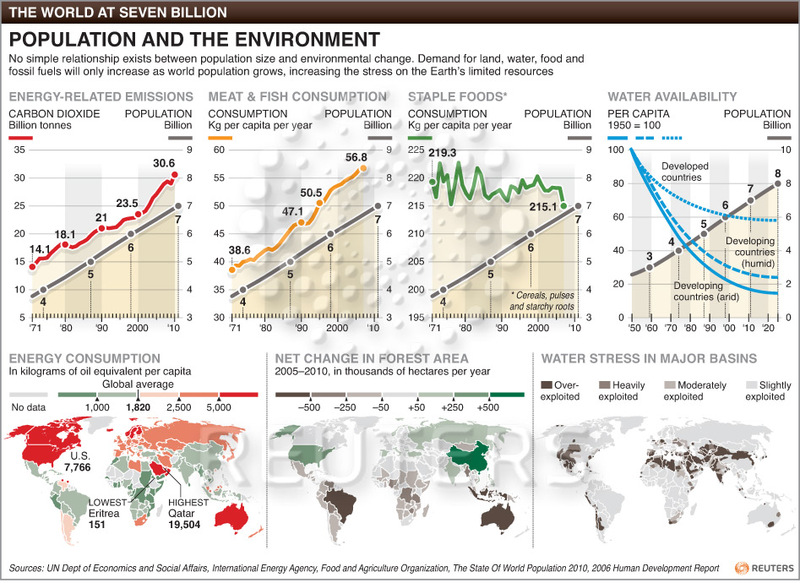 The result is continued depletion of many natural resources. Fossil fuels and other non-renewable resources are finite and continued exploitation and consumption results in the increasing scarcity of such resources. Resources such as water are renewable yet fixed in quantity and increasing numbers of consumer’s results in less of the resource available for each individual. Food production relies on land that is suitable agricultural use. There is only so much land suitable for agricultural production and, yet again, increasing numbers of consumers means that greater production must come from that finite land area. As a consequence of continued population growth, agriculture may soon be unable to feed us all, with the poor of the world suffering the most. A growing human population requires space to live, and the ubiquitous sprawl of urban development is a stark example of this. The more of us there are the less space there is for each us and the less space there is for the myriad other species we share our planet with. Continued population and consumption growth is accelerating the loss of biodiversity and resulting in the widespread extinction of species.